Build and run your own city in CityVille. Once you have cleared some land, your city planner will help you to build up a thriving metropolis. Modernize and build housing for your citizens, add decorations to increase property value, plant and harvest crops to run restaurants and import goods to run retail stores. Trade with friends via boats and trains and build a business empire. After you’ve cleared the land, place road pieces to activate buildings, deliveries and flow of citizens. Construct houses, businesses and Community buildings like post offices and schools, and place decorations to increase housing rent and business payouts. Plant and harvest timed crops to get various amounts of goods. Send ships to import goods with various journey times to fit your play schedule. Harvested and imported goods are your supplies, required to make the businesses run and earn money. You can buy more storage, piers, and farm plots to grow the city quickly. Players can also buy or sell goods. Plan your city layout to make the citizens happy and earn more money as they eat and shop. Run sales at businesses to attract a crowd or make decorative animations for people to visit. Upgrade houses to get better shoppers and special rewards. Visit your neighbors’ cities to help them accomplish tasks, and earn energy, decorations and collectible items for yourself. Help friends by harvesting crops and sending trains or ships; also help them construct businesses and residences, and send friends gifts to finish their Community buildings and clear ground for them to build on. As you go you earn experience and things for your own collections and to share with more friends. Buy and sell goods sent via rail or sea. Expand your bussinesses to your friends’ cities, and allow them to build new locations for their bussinesses in yours. You can build an empire of business locations but don’t forget to supply them with goods. The more locations you get, the bigger you can grow your business headquarters in your own city. As the city leader you must guide your city to become a thriving metropolis. The city advisor will always show you fun things to try next to make a great city. When you finish tasks you can unlock rare buildings and decorations. If you have issues regarding these features, please contact Customer Support. 1. If I don’t click on coins/xp/hearts/etc, will they still be added? Yes, everything that drops is added automatically, you don’t have to click on it (please note that xp and energy are added as soon as they drop, not when you click on them or when they vanish from your screen); however clicking on those bonuses will start a “bonus” meter (under the xp bar) that will give you extra coins. 2. How do I gain xp? Players can gain XP from actions completed in the game. Once an action is completed an XP doober will drop in the shape of a blue star. Collecting these doobers will increase the players XP. Note: Your XP bar will automatically fill, even without clicking on the doober. 3. How can I buy a new building or decoration? Click on the “Build” button, navigate to the appropriate tab and purchase it, make sure you meet all the requirements to buy it (such as coins, level and neighbors). 4. Where can I place the new building or decoration? Community buildings can be placed anywhere; however, Housing buildings and Businesses must be placed next to a road or a sidewalk. Decorations can be placed anywhere, but are most useful next to businesses and houses, since they will give bonuses to rent/income. 5. How can I start and finish the construction of a business or a house? Once you place it in your city you will see how many clicks it will take to finish construction by hovering over the building; each click will take 1energy. 6. My new house/business is grayed out, with a red sign on top of the building, and I can’t collect rent/income, what’s wrong? 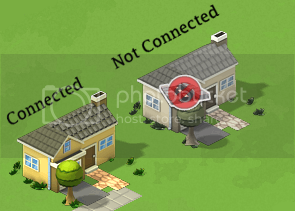 Make sure that the house/business is connected to a road or a sidewalk, if you think it is connected try moving it slightly to double check. If your building looks grayed out with a red sign then it is not correctly connected to a road. 7. How do I move, rotate or delete/remove an object? Use the arrow tool above the build button then select the desired tool. 8. How often can I collect rent from a residence? You can hover over each house in your city to find out how soon you can collect rent, or you can enter the build menu and hover over a residence to find out how often you can collect rent from that type of residence. 9. How can I build a Community Building? You can start construction on it just like any other building, hovering over the unfinished building will tell you how many clicks you still need; however, in order to finish it you will need help from your friends (or you can purchase the required materials with city cash). You can click on the unfinished community building for a list of everything that is required to finish it. Instead of additional materials, some community buildings need additional staff to run them, you can either hire your friends for these positions or unlock them with city cash. 10. Can I buy more plots for my crops? Yes you can, from the farming menu for the specified amount of coins. 11. How much energy does it cost to plant crops and to harvest crops? It does not take energy to plant crops but it does take 1 energy to harvest a crop. 12. How many goods can one crop produce? Crops can only be harvested one time, and then need to be replanted. The more expensive the crop is, the more goods you will receive when harvesting. You can find out how many goods a crop will produce by hovering over it in the farming menu. Currently “Peas” have the highest goods value. 13. How quickly do crops wither? Except for Strawberries (which do not wither), crops wither at 2x growth time, which means that a 1 hour crop will wither 2 hours after it’s ready for harvesting (or 3 hours after being planted). 14. What do the hearts do? Hearts increase your reputation level. Each time your reputation level increases you gain bonus goods appropriate for that level. 15. How can I get more energy? Your energy will refill according to the timer on your energy bar, every time the timer counts down to 0 you will receive 1 energy point up to your max energy. You can also receive more energy by visiting your neighbors, as a random bonus drop for various actions, and you can purchase more energy with city cash from the “Build” menu. In addition, energy can be gifted from the free gifts page. When you reach the next level your energy bar will be fully refilled and your maximum energy is increased by 1 (up to the current maximum energy limit). 16. How can I get more goods? You can get more goods by harvesting crops, through shipping, through gifting, or by exchanging goods for coins by using the train system. 17. Shipping, what is it? And how does it work? Shipping goods is one of the primary means of supplying your businesses. Before you can start you will need to build a pier (which can be found in “Build” under “Shipping” and must be placed near water) then click on the boat to send it on a mission to return with goods. Each has a limited number of boats it can hold and comes with one boat when built. Please note that if you have more than one boat, you will need to individually select what city you would like each boat to go to. To send a boat to pick up goods, click on the boat and select the city you desire goods from. IMPORTANT: To send multiple ships to separate cities, be sure close the “Cancel” button between each shipment. 18. How does the train work? How do I buy/sell goods using the train? This game has a great feature that will allow you to trade resources with your neighbors via the trains that run from city to city. Running low on goods, but have plenty of coins? Why not send out a train to deliver more goods and give your friends a chance to sell some of theirs. Once you have reached all the requirements, click on the train platform. This will open a menu that will display the “Train Schedule.” On this schedule you can find the cost and choose where to buy goods from. If you would like to sell goods, click on the “sell goods” tab and determine where you would like to sell goods by train. The price and income will be listed. 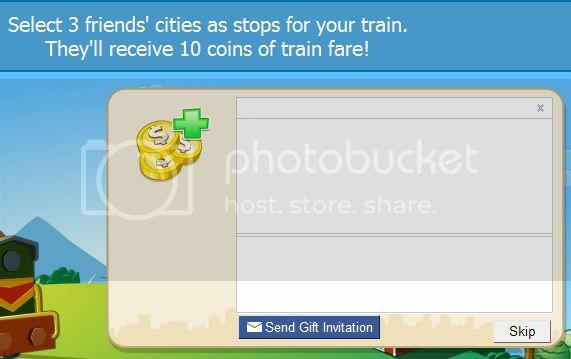 Once you select a train you will be taken to the invite page where you can select stops for your train to make (unless you’re sending the train to Sam or Charlie); every neighbor you select will receive a bonus and will have the opportunity to either buy or sell goods, depending on the train you send. When you click on that icon the train will arrive with your delivery. * Please note that the train will always come back with the amount of goods/coins you saw on the train schedule. Part 2: Receiving a train. When you click on that icon the train will arrive and present you with the maximum amount of goods you can buy (or sell). You will have a choice to accept it, decline it, or decide later. If you click on the “Buy” button you will have the option to either buy the maximum amount or reduce the amount of goods you wish to buy (in increments of 5). Once you decide how much goods you wish to purchase just click on “Buy” to receive them and the train will go on its way. *Please note that the amount of goods you buy (or sell) will not affect how much goods/coins your neighbor will receive once their train returns. And that’s all there is to using the train system; a pretty simple way to buy a few extra goods when you need them or to sell your extra supplies for more coins, as well as a great way to help out your neighbors! 19. How can I set up a Franchise? You should visit a friend with an available “Empty Lot” (see image below), click on the empty lot and select which business you would like to expand. Your friend must have previously placed an empty lot on their city by selecting it from the Build Menu under the Businesses tab for 0 coins. The more empty lots you have, the more franchises can be built in a city. You must first have a business in your city to expand that franchise into your neighbor’s city. To check on the status of your franchises, click the “My Stuff” button and select Franchises. After placing your franchise on your neighbor’s city, your neighbor will have to accept it before the business is built. Wait for your neighbor to accept the franchise in their city. You can remind them by clicking the “Remind” button in the Franchises Menu. You may only collect after your neighbor has accepted your franchise request. If your neighbor declines your request for a franchise, the business will not be built in their city. 20. How can I expand my city? In order to unlock an expansion you will need permits, which you can get from your friends or purchase with city cash. Once you have an expansion available you can place it to expand your city. You can expand your city by sections. Place your 12 x 12 plot anywhere around the perimeter of your city to expand a section of your city. Each expansion plot costs the amount of coins specified in the build menu. 21. What do I get from completing a collection? Each collection has a different set of rewards. The rewards are shown on the collections page. They vary from coin, energy, XP, to goods. You can also receive items only obtainable from collections. 22. How do you obtain collection items? 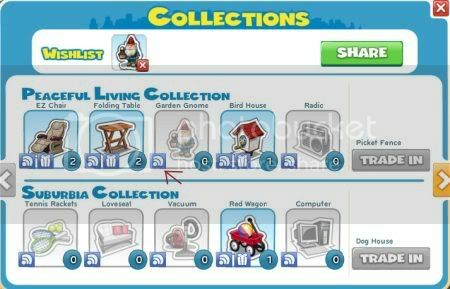 Collection items have a chance to drop whenever you collect rent from homes or collect earnings from businesses. You can also get Collection Items by harvesting crops. 23. Is there a gift or collection item wish list? How do I use it? Collections have a Wishlist, click on the tab in the lower right of your game (above the Build tab) and then click on “Collections” where you’ll see your Wishlist at the top. You can also add items to your Wishlist from your inventory if you have the desired items already in your inventory. 24. How do I send tour busses to my friends’ businesses? When you visit a friend you can click one of their businesses to send a tour bus to that business. This will help you collect hearts and coins. 25. How many game levels are there? Currently, 60 is the maximum level achievable. 26. What is the maximum amount of neighbors you can have? Currently you may have 300 neighbors. These neighbors will help you reach certain goals or unlock certain in game features. You may only display up to 50 neighbors on your neighbor ladder. You may only collect from 50 neighbors per day. 27. How many times can I send a gift request? 28. How many times a day can I send a neighbor request? 29. 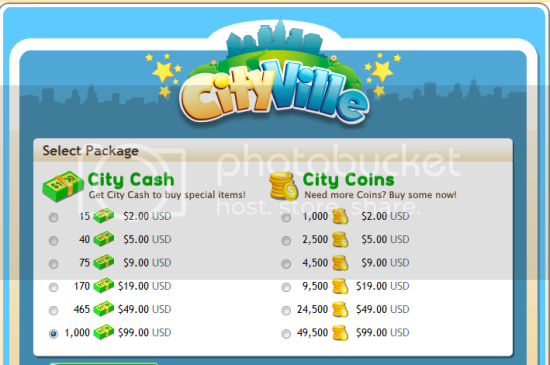 What time zone is CityVille ran on? CityVille is on Eastern Standard Time (EST) unless otherwise noted. 30. How do I get City Cash? 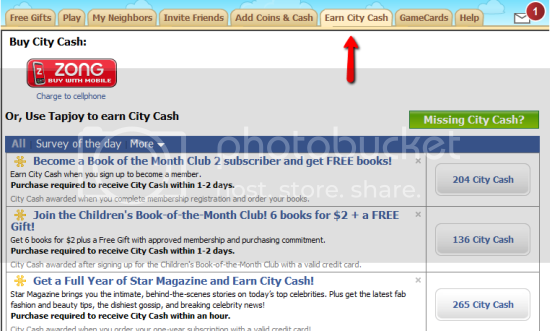 or you can purchase City Coins and City Cash through the “Add Coins and Cash” tab. 31. Who can I contact if I need help?